Portland punk metal hellions, TOXIC HOLOCAUST, are pleased to unleash their most volatile offering to date. Titled Chemistry of Consciousness, the devious new full-length spews forth eleven tracks of revved up, road-raging bestial devastation. Chemistry Of Consciousness was recorded by the band, mixed with Kurt Ballou (Converge) at his own GodCity Studio and mastered by Brad Boatright (Sleep, From Ashes Rise, Nails) at Audiosiege Engineering. Chemistry of Consciousness is the sound of Discharge on speed, Slayer with a punk rock chip on its shoulder, The Exploited on a Metallica overdose. It is the perfect marriage of punk angst and metal guitar hooks. 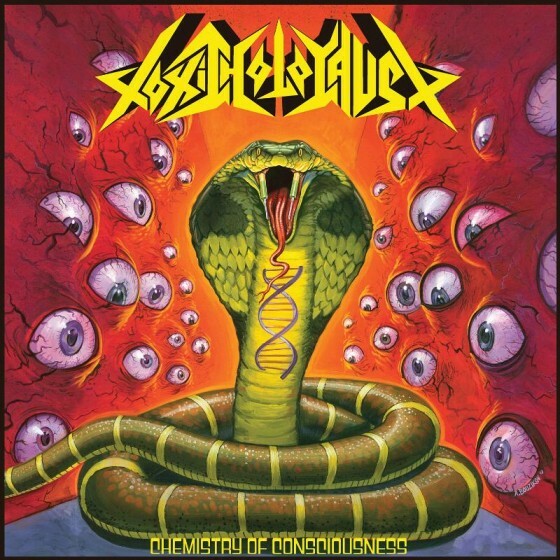 If there’s one thing the punks and the heshers will agree on in 2013, it’s that TOXIC HOLOCAUST‘s Chemistry of Consciousness is a rager of a record destined to top any worthwhile best of 2013 list. Recommended for devout followers of Municipal Waste, DRI, Sodom, Midnight, GBH etc. Chemistry Of Consciousness will detonate in North America on October 29 (October 25 in Benelux/DE/Finland and October 28 in UK/World). Further TOXIC happenings, including preorder packages and live takeovers, to be announced in the coming weeks.